Life seems to be so hectic lately. Things that should be simple have suddenly complicated and nothing is easy anymore. Hint, my updating has been very irregular! Do I have a solution to make life completely wonderful and carefree? Well, not quite, but I do have something that can make life a little easier beauty-wise. 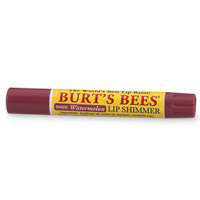 The life or lip saver is Burt’s Bees Lip Shimmer in watermelon. It moisturizes your lips and gives them a nice tint. I like this balm, but it is not my favorite shade. It is a very unnatural pink color that does not go with my fair skin. The balm does have a good, minty smell to it and it helps the cracks in my lips. It is for days when you either want to go for a “natural” look or make your lips look pretty, but not overpowering. It seems like the balm does not last very long, but overall this is a decent product. It costs around five dollars and for a 2 in 1 balm, that is nice. Color and moisture! Try it out and I suggest fair skin ladies to steer clear of the watermelon color. Enjoy and remember it is the little things in life that make a huge difference! I have this but in a different shade I love it! Why thank you gorgeous. Yours is pretty amazing as well. I LOVE NEUTROGENA MASCARA!